He studied at the Athens School of Fine Arts (1921-1926). A member of the ‘Techni’ and ‘Stathmi’ groups of artists, he participated in the events they organised; he also exhibited at the Venice Biennale (1934, 1964) and the Sao Paulo Bienal (1959). In 1960, he received the Greek Guggenheim Award from AICA, Greek Section. He taught at the Papastrateios School and, after World War II, at the Athens Institute of Technology. He pursued printmaking, especially during the German Occupation, as well as stage design and magazine illustration; he also painted the Church of Agios Dionyssios Areopagitis in Athens (1936-1939). 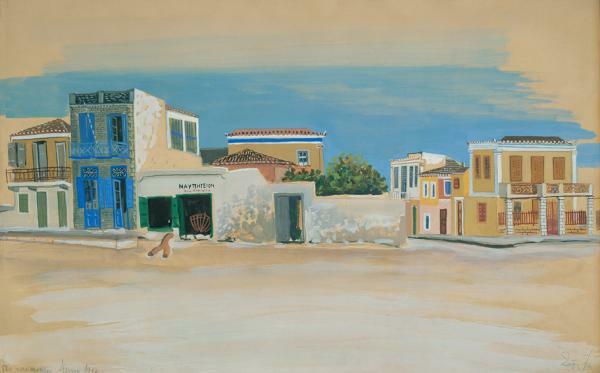 His house and studio, near the Acropolis, are now open as the Atelier Spyros Vassiliou. An artist of the Generation of the ’30s, he sought ‘Greekness’ in art, mainly producing landscapes and social scenes, combining traditional and modern elements.